The Skinny: Involving pseudo-Fifth Wave drama which isn't as powerful as its more internationally renowned cousins, but still packs a satisfying dramatic punch. Wu Chien-Lien gives a fine central performance. Dragon Town Story bears the stamp of producer Zhang Yimou, the Fifth Wave's most celebrated auteur, AND carries the financial backing of Charles Heung, HK's most famous triad producer. The result: a Chinese film produced by Hong Kong people starring a Taiwanese actress. 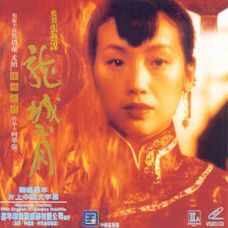 Wu Chien-Lien is Jiang Lan-Juan, who survived the slaughter of her family on the day of her wedding. Nine years later she hires legendary assassin Li Qing-Yang (You Yong) to kill the man who slew her family. The murderer, Xiong Jin-Bao (Huang Zhong-Qiu), is a rich army officer with a wife and twenty year-old son. Juan and Yang pretend to be husband and wife to slip into Dragon Town, but the first assassination attempt goes awry. Before a second attempt can be made, the two find themselves guests of Xiong, as he clearly begins to suspect that these two are the ones out to get him. Meanwhile, Qing-Yang and Jin-Bao find themselves drawn to one another.